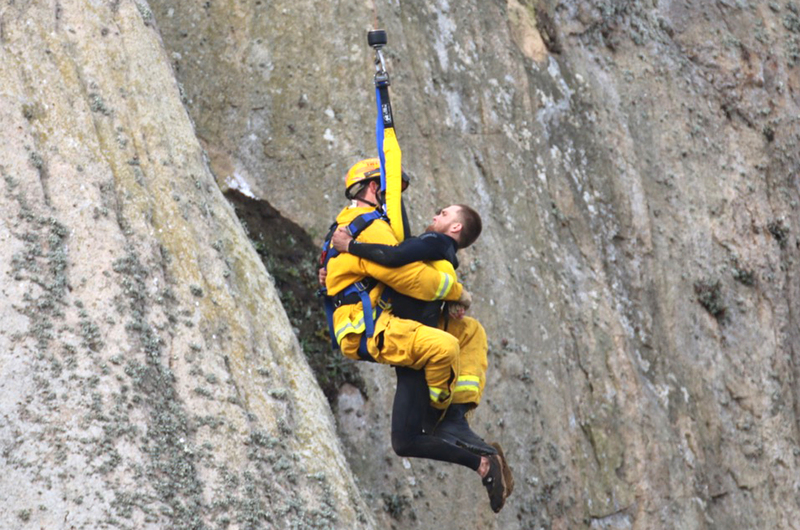 MORRO BAY, Calif. -- A man who had to be rescued when he climbed a California cliff to propose to his girlfriend via cellphone video later was acting erratically and was found to be high on methamphetamine, authorities said Friday. Morro Bay Fire Chief Steve Knuckles said that 27-year-old Michael Banks was arrested on suspicion of possessing methamphetamine. Knuckles said Banks climbed to the top of the cliff early Thursday to propose. Banks got stuck on the way down. No one has spoken to the girlfriend. Knuckles said Friday that he didn't know if the proposal was real only that Banks told "several people" during the rescue that he had asked for her hand in marriage. Police were not immediately available for comment. Banks "took a different trail down, much steeper" and became stranded, said Capt. Todd Gailey. "He couldn't go any direction, on a sheer ledge, with his feet dangling 80 feet off the ground." Rescuers called in a helicopter, and a crew member descended by cable to hoist Banks from the narrow ledge. Banks was calm for most of the ordeal, but "a little unnerved" at that part, Gailey said. He was not hurt. About 4 p.m. Thursday Banks was arrested when witnesses reported he was acting erratically. CBS affiliate KCOY reported Banks was also cited for misdemeanor trespassing. Morro Rock is a 600-foot landmark just offshore from the community of Morro Bay. Climbing is banned, but some go anyway, and there have been several fatal falls over the years. Banks will be charged for the chopper ride. Banks said nothing during the rescue about any second thoughts on his choice of setting for the proposal, Gailey said. However, the fire captain said others should consider a place "where you're not in danger of falling off a cliff." Banks has been booked into jail and isn't available for comment.